Progress continues on the new library. We've had several heavy rain days, but we hope the building will be roofed, bricked, and with most of the windows in by the end of March or early April. 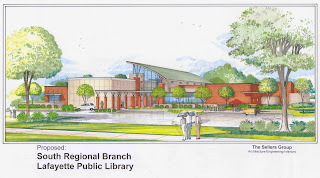 I heard on the radio the other day that all the road work causing one-lane and traffic delays around Johnston and Duhon was due to the library construction. 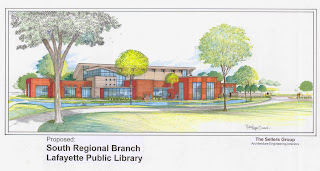 While the road work, including the finishing of Duhon Road Extension from Johnston to Robley Drive (extension) will benefit everyone visiting the library, the road project is a separate project that was in the works before the site was purchased for the new library. This is what the facility will look like from Duhon Road (the entrance). This is what the facility will look like from Johnston St. The Sellers Group is the architect. The contractor is JB Mouton. The slideshow (taken last week) gives you a view of the interior progress. It was a challenge getting to and from the building in the mud so there are not many exterior shots. I hope to have some front exterior pictures soon. While the interior walls won't go up until the building is enclosed from the elements, the metal wall studs are up and the rooms are starting to take shape. We are planning to open by the end of 2008.